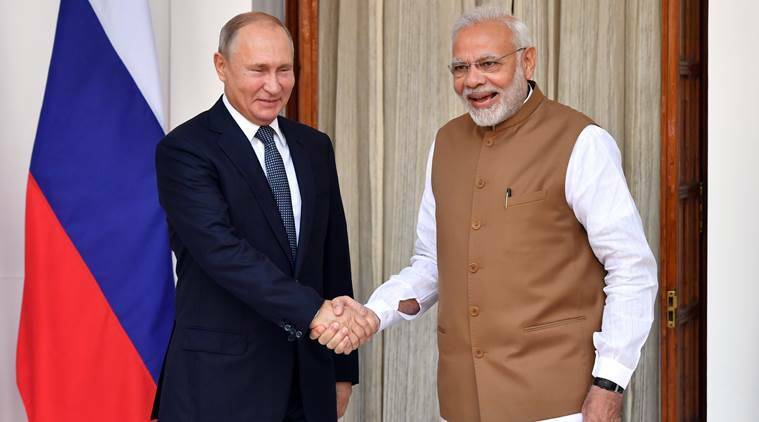 Vladimir Putin Sends Good Wishes to Modi for Elections 2019 The conversation between the two leaders focused mainly on bilateral cooperation and current international issues. Ahead of general elections in India, Russian President Vladimir Putin on Monday wished Prime Minister of India Narendra Modi success during a phone conversation, a statement from the Russian embassy said. The conversation between the two leaders focused mainly on bilateral cooperation and current international issues and they congratulated each other on the New Year, the statement said. "Vladimir Putin wished Narendra Modi success in connection with the upcoming parliamentary elections in India," the statement added. Modi and Putin appreciated milestones in the "Special and Privileged Strategic Partnership" amid the two countries in 2018. Recalling their successful discussions at an informal summit at Sochi in May and during Putin's visit to New Delhi in October for the annual summit, the two leaders "agreed to maintain the momentum in the bilateral relations", said a statement from the external affairs ministry. The leaders as well confirmed their mutual disposition to increase cooperation in fighting international terrorism and "solving other pressing world issues", the Russian embassy statement said. Putin reiterated the call to the Indian premier to the annual Eastern Economic Forum in September. Modi expressed his best wishes to the Russian people on the occasion of Christmas, which was celebrated in Russia on Monday. The leaders agreed India-Russia cooperation plays a crucial role in the global multilateral order and that the two sides will continue their close consultations at the United Nations, BRICS or Brazil, Russia, India, China, and South Africa, Shanghai Cooperation Organization and other multilateral organizations, the external affairs ministry statement said.